Matt Owens (bass) with several groups including John Ellis (piano) Neil Yates (trumpet) , various chamber music ensembles and vocalists . Recorded at Limefield Studio , Manchester.No recording date given. There is an undeniably light music quality about the suite of pieces that make up this fascinating, though occasionally superficial recital by Manchester based composer and bass player, Matt Owens. Quite a lot of the music could pass as T.V. theme music in the making but it is accomplished with such consummate musicianship that one is loath to say anything negative about it. If you are a music lover who simply delights in euphonic pleasures then you are sure to find something here that will ignite your aesthetic sensibilities but whilst jazz devices are employed in its construction and execution there is little about this cross genre music that fits comfortably within accepted jazz categorisations. 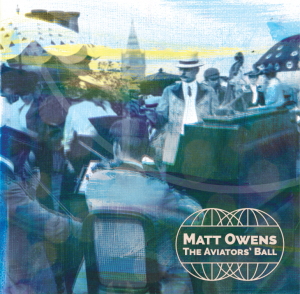 It is essentially light concert music with jazzy licks in the solo passages and on that level it is very enjoyable completely fulfilling Owens’ aim to `create a melodic album where simple melodies inspired by jazz, folk and world music would be enriched by using differing textures and arrangements`. Whilst most of it drifts by in a pleasingly ambient sort of way one track is sufficiently visceral to ruffle the hair on the back of your head and that is a haunting Celtic sounding rendition of `Black is the Colour` sung by Rioghnach Connolly, delivered with such earthiness that it even challenges the Nina Simone version. So if you are in the market for something a little different it might be worth giving this a whirl.